Los verbos irregulares del imperfecto SerIrVer. 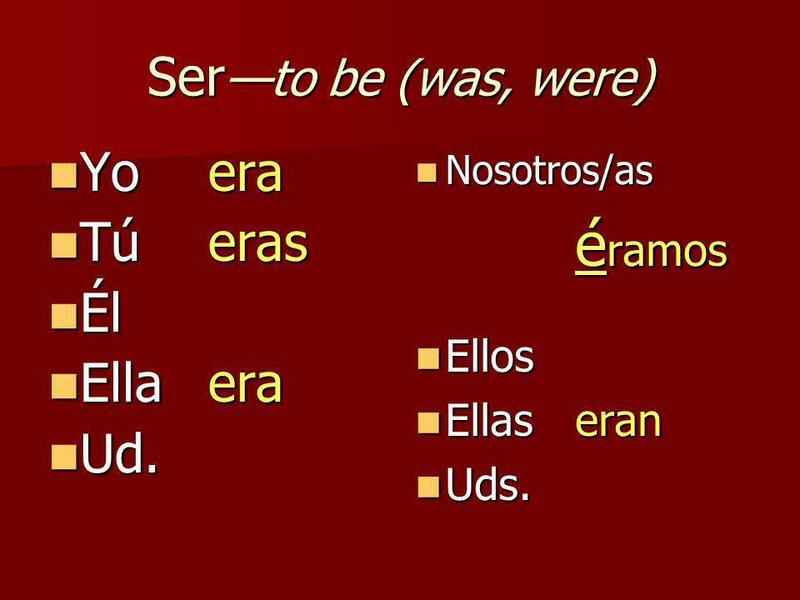 Ser to be (was, were) Yo era Yo era Túeras Túeras Él Él Ellaera Ellaera Ud. Ud. Nosotros/as Nosotros/as. 2 Ser to be (was, were) Yo era Yo era Túeras Túeras Él Él Ellaera Ellaera Ud. Ud. Nosotros/as Nosotros/as é ramos Ellos Ellos Ellaseran Ellaseran Uds. Uds. 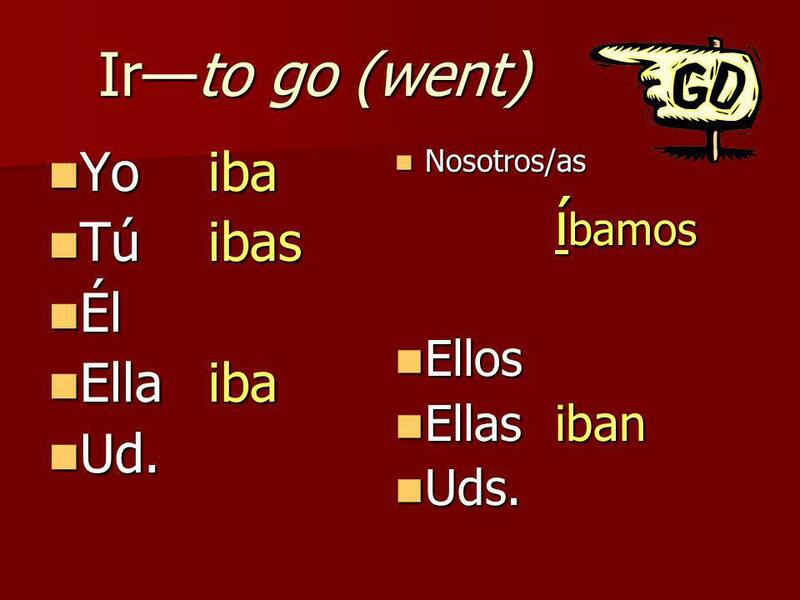 3 Irto go (went) Yoiba Yoiba Túibas Túibas Él Él Ellaiba Ellaiba Ud. Ud. Nosotros/as Nosotros/as í bamos Ellos Ellos Ellasiban Ellasiban Uds. Uds. 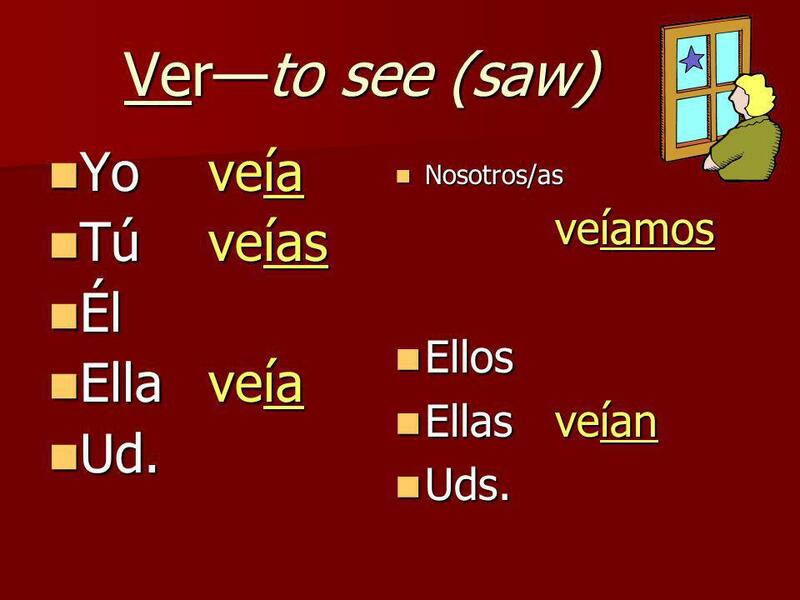 4 Verto see (saw) Yoveía Yoveía Túveías Túveías Él Él Ellaveía Ellaveía Ud. Ud. Nosotros/as Nosotros/as veíamos Ellos Ellos Ellasveían Ellasveían Uds. Uds. 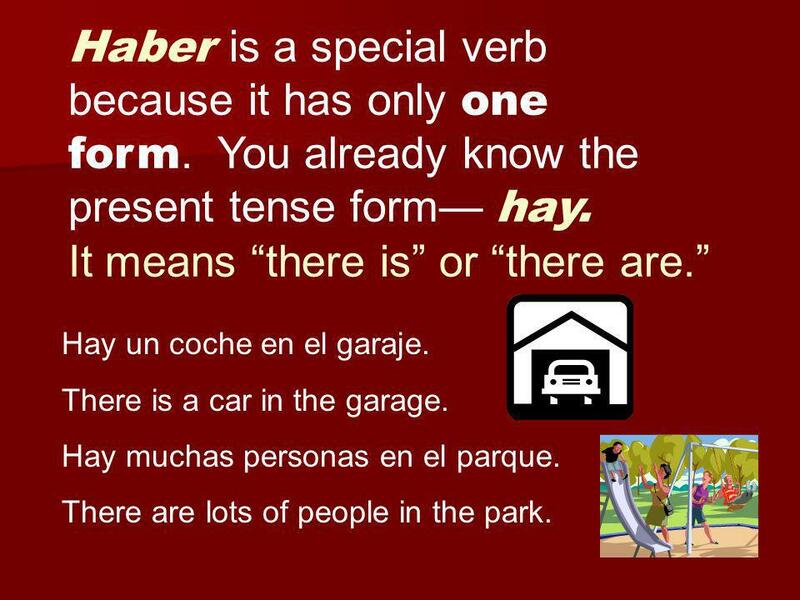 6 Haber is a special verb because it has only one form. You already know the present tense form hay. It means there is or there are. Hay un coche en el garaje. There is a car in the garage. Hay muchas personas en el parque. There are lots of people in the park. 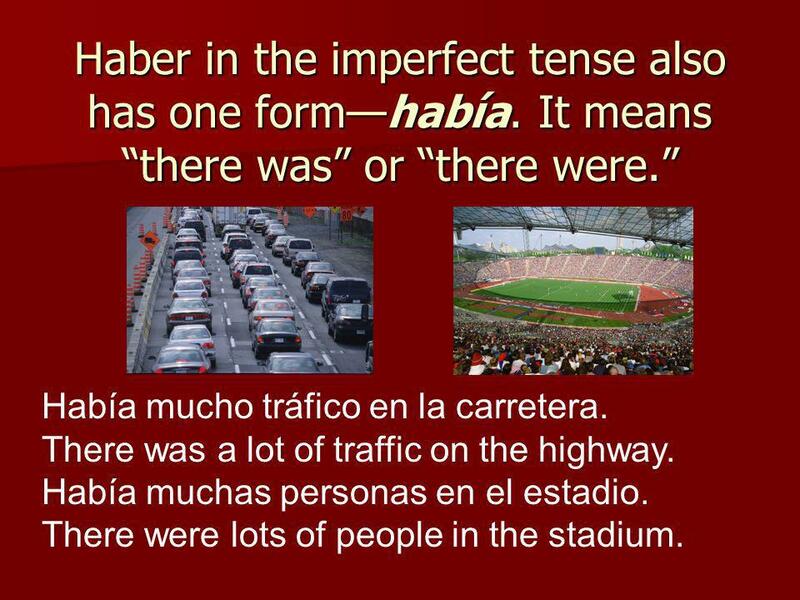 7 Haber in the imperfect tense also has one formhabía. It means there was or there were. Había mucho tráfico en la carretera. There was a lot of traffic on the highway. Había muchas personas en el estadio. There were lots of people in the stadium. Descargar ppt "Los verbos irregulares del imperfecto SerIrVer. Ser to be (was, were) Yo era Yo era Túeras Túeras Él Él Ellaera Ellaera Ud. Ud. Nosotros/as Nosotros/as." 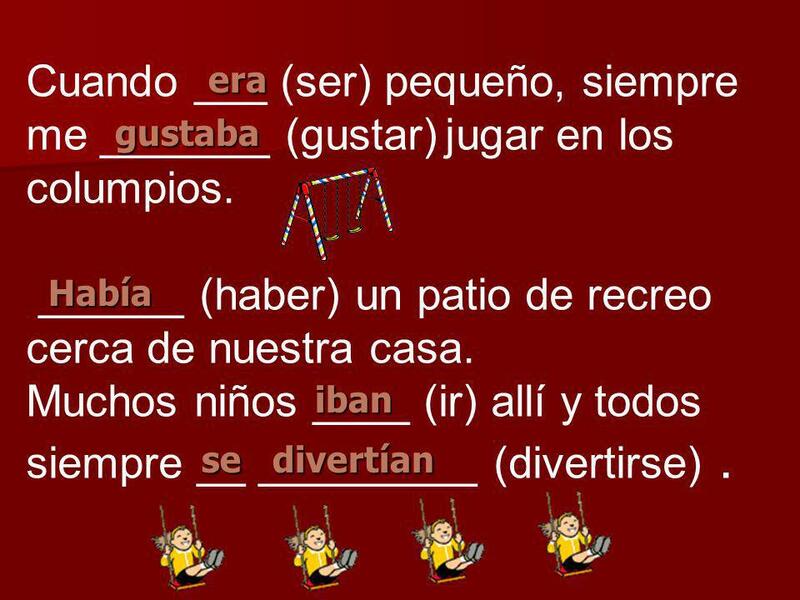 THE IMPERFECT The continuous past…….the Flinstones of Spanish. Imperfecto Use the imperfect to talk about what you used to do or what you were like in the past. El imperfecto Preterits Crazy Uncle. ¡NO sé nada! Cuando tenía 7 años, siempre hablaba con mis amigo; sin embargo, ahorra les habla por el telefono porque. 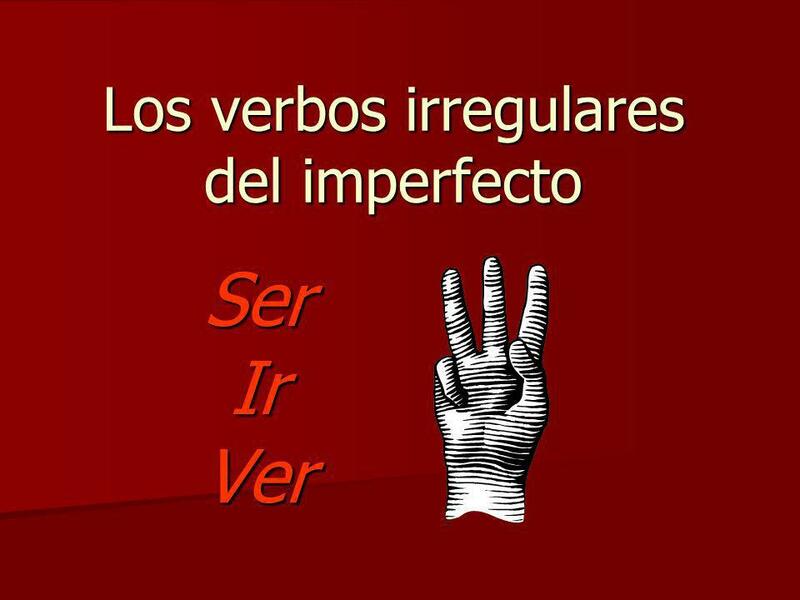 The Imperfect Tense: Irregular Verbs Página 179 The Imperfect Tense: Irregular Verbs Página 179. EL IMPERFECTO The imperfect is used to talk about actions that happened regularly in the past, such as used to do something and was/were + -ing words For. Háganlo ahora Escriban en inglés 1. Siempre 2. Todos los días 3. Cada día 4. Generalmente 5. Muchas veces 6. Nunca 7. Cada semana Objetivo: Aprender el. To talk about what you _______ or what you used to do or ________ in the past use the ________. what you were like imperfect. The Imperfect Tense Page 203 Avancemos 2. The Imperfect Tense: Regular Verbs Over and over and over and over and over in the past. ~The Imperfect Tense~. 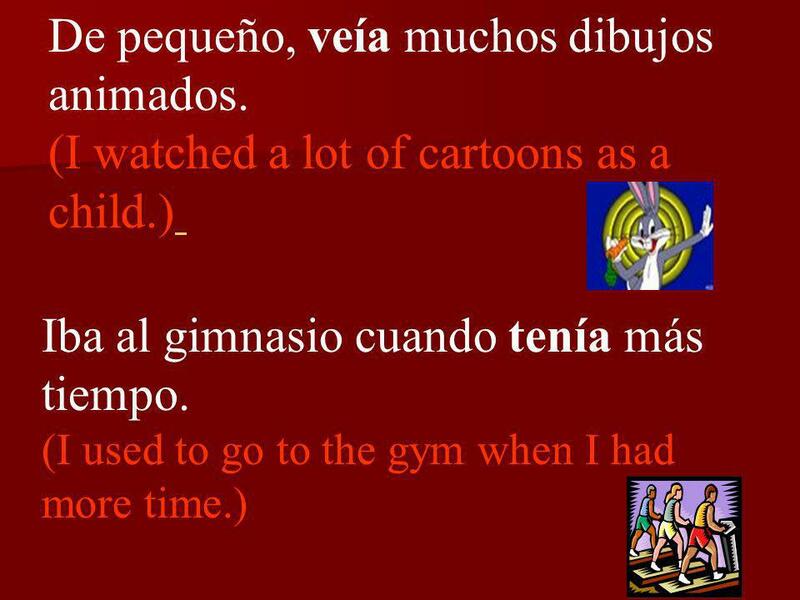 2 Main Past Tenses in Spanish In Spanish, there are 2 main tenses used to talk in the past: 1. El Pretérito 2. El Imperfecto. Practice distinguishing between the preterite and imperfect tenses. Usos del imperfecto… …y repaso de formas.. Use the imperfect to “Set the scene” “Set the scene” Era el viernes por la noche. Era el viernes por la noche. Imperfect… To talk about what you used to do or what you were doing in the past use the imperfect. El imperfecto Another Form of the Past Tense. Another form of past tense Used to express things you ‘used to’ do Used to express action still in progress. THE IMPERFECT TENSE describe things that used to happen describe places,objects and people (in the past) give background description that is secondary.